David Roberts Jr. has been around the wine, beer, and spirits world most of his life. His father, a longtime wholesaler, was well-versed in the sales and distribution side of the business, but digging into the production end of things is an entirely different matter. While there are certain similarities between brewing, making wine and distilling, each step of his education along the way has provided a new set of hurdles. With the roll out of the family’s newest product, Dry Line Cape Cod gin, he says he’s still figuring things out as he goes. The gin, the latest from South Hollow Spirits, from the family behind Truro Vineyards, is the culmination of years of experimenting on Roberts’ part. He had been brewing commercially for ten years before his family bought the vineyard in 2007, at Flying Monkey in Kansas City, and SweetWater in Atlanta. Not long after that, he already had his sights on distilling. At the time they were dumping the crushed grape skins from the winery on the compost pile at the local dump — their facility is just down the road from where his parents have a home in Truro. Matyas Vogel, the veteran Hungarian winemaker, who they kept on from the vineyard’s previous owners, found that unacceptable. “He said, ‘In the old country, this is a crime. We would never do this,’” Roberts explained. Instead, they’d take the grape skins, add water, sugar, and yeast and make a second wine, then take that to the state-owned distillery and make moonshine from it. Around that time, they’d been trying to figure out what to do with an old carriage house on the property that was falling apart. Every winter, after a nor’easter would pass through, he’d be shocked to see it was still standing. They bought a food truck, built some bathrooms and answered a couple of needs for their winery and tourism business at once. But instead of trying to make more wine after the improvements, they wanted to branch out in a different direction. It occurred to Roberts that they already had the beginnings of the process Vogel talked about on hand, so why not try distilling with them, making grappa or something similar? Roberts, who knew his way around brewing, wanted to learn as much as he could about the process of distilling before jumping into it, so he started attending workshops at the American Distilling Institute in 2010. It was four years before they’d put out their first batch; they now produce a few styles including a Twenty Boat spiced rum, and an amber rum. When he first got into winemaking, Roberts says it was the seasonality of it, and the lengthy process that intrigued him. In brewing, you can turnover a product in 2-3 weeks from fermentation to conditioning and bottling. With wine it’s not so simple. Right now they’re doing spring pruning, followed by laying down the vines and waiting for them to bare fruit. In the fall they’ll harvest, then wait for nature to take its course as fermentation occurs. 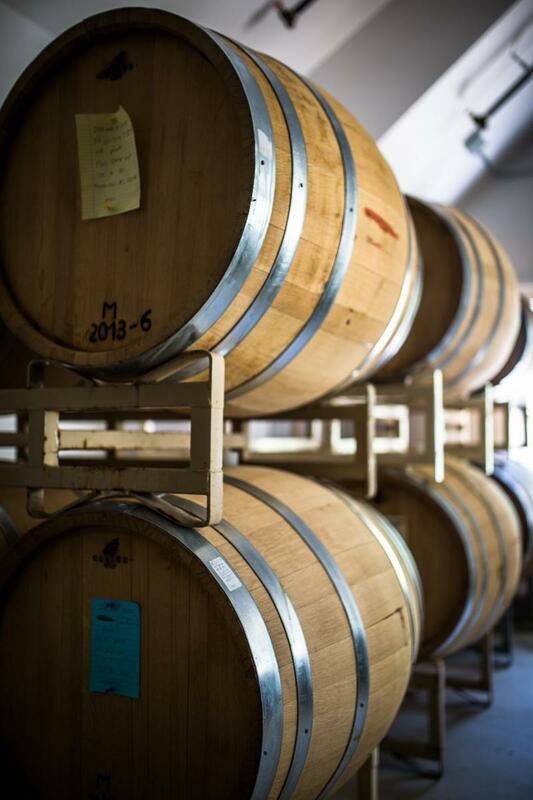 By next spring the whites should be ready, but the reds will need to be racked into barrels. “I like the patience required,” he says. Distilling takes that even further, particularly when it comes to aging. After having figured out the rum making process, making the move to gin wasn’t entirely logical, but they worked with the idea of using what they have on hand already as a jumping off point yet again, repurposing the cane sugar from the rum as their base for the gin. “I wanted to do it to differentiate ourselves. Almost all distilleries that don’t have a vodka still are bringing in grain neutral spirits, and making vodka with it. 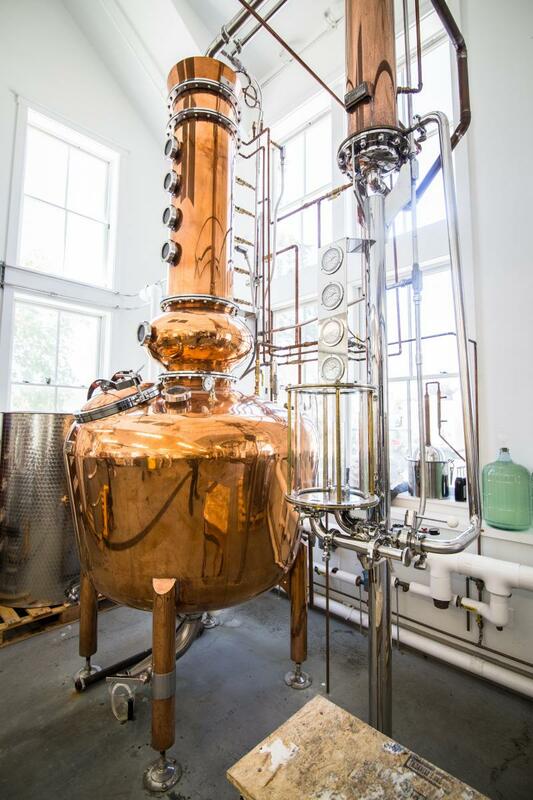 You can say ‘produced by’ on your label instead of ‘distilled by.’ Almost everybody that’s making gin is buying grain neutral spirits and diluting, then redistilling them,” he says of a common practice in the distilling industry, that has caused some recent controversy. That makes for a slightly out of the ordinary gin. The cane sugar base results in something of a sweeter end product, but over the course of a lot of trial and error he’s been working with a broad palate of botanicals to try to hone in on the finished results. They began with the traditional gin standbys, including juniper from the Eastern Red Cedar, coriander, lemon and orange peel. After about five to six batches, he brought in friends and local Cape bartenders for blind tastings to further phone the recipe. One batch might be too anise forward, he’d learn, so it was back to the drawing board. One of the major botanicals, angelica root, comes from a nearby farmer friend — the one they now give their grape skin compost to — who uses it to grow angelica flowers. Right now, if you grab a bottle you’re likely to get plenty of citrus, and something of a sweet note balanced out by peppery spice from the grains of paradise.